I am finding that many people still aren't familiar with Linked Pages and the power of them. Read on to see a good example of how and when to use them. Lets say you have a handful of "Call To Action"s.
These are all common CTAs that are applicable throughout the site. What I like to do is create a new Page Type - CTA. This generally has title, copy, button text, and button url fields. In the Pages applicaiton in the Content Tree I will create a Folder called Global CTAs. I will create a new page of CTA for the 5 I mentioned above. Now what we can do is use these CTAs under other pages by linking them where we want them. We can put a repeater on a Page Template that looks for children of Page Type - CTA. Click on the Page you want the CTAs on then click New (+). Select "Link an existing page" at the bottom of the main window. This will bring up a new dialoug "Link Page". Find the CTA (page) you want to add to this Page and "Link" it. In my example I am adding 3 CTA's to the About Us page. In the screenshot above you can see that the CTAs with the arrow icon are Linked Pages. I added another CTA to show that you don't have to pull all CTAs from the Global folder we created. We can still create unique CTAs for specific sections and the Repeater will still pull them in. The advantage here of using Linked Pages is we only have to create a CTA once and we can re-use it throughout the site on many pages. It allows us to make an update to the one Global CTA which in turn is reflected anywhere it is linked up in the site. 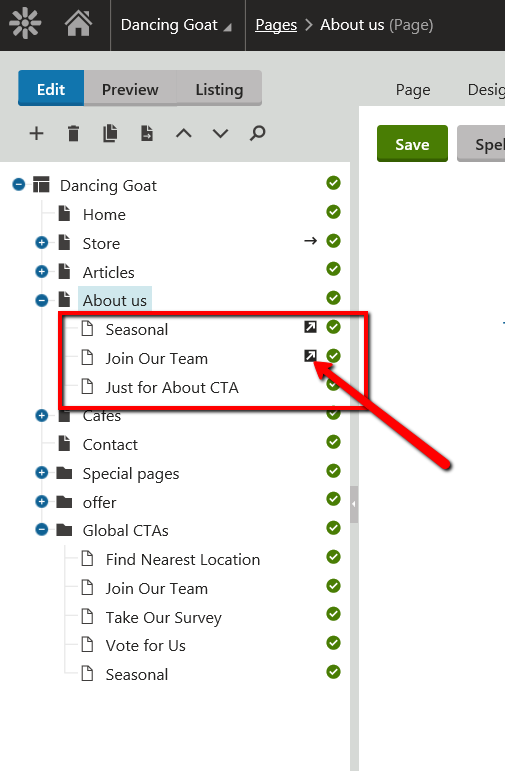 If you have a Seasonal CTA for example you can update that throughout the year and not have to go through and update it everywhere on the site. 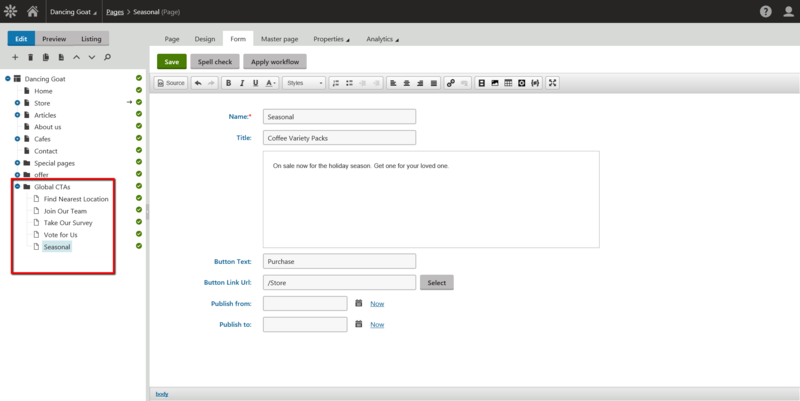 Using Linked Pages also allows the editor to sort them as they want them to appear per page. There are other cases where you may want to link actual pages used on the site in a similar way relationships are used. You may want to link directly back to the main page in your transformation instead of to the child page. So in your transformation instead of using <%# GetDocumentUrl() %> you would use <%# GetDocumentUrl(Eval("DocumentID")) %> .